A few weeks ago, I swatched 2 of the 3 Teeez holo polishes : Smooth and Cool. Teeez Outta Control is a warm purple scattered holo with a faint linear effect. It applies smoothly without any bold spots or patchiness and requires 2 coats to reach full opacity. It dries to a shinny finish and I must say that I didn't expect such a flawless formula from a small brand. I really loved wearing Outta Control and after 4 days it was still looking good with minimum tipwear. If you can get your hands on it or on Smooth and Cool, I'd strongly advise you getting them. So pretty! I wish I could get my hands on these! I like the flower design on the bottles. It's a nice touch. I was lucky enough to get these from a kind gal too but untried as of now...awesome pix of Outta Control. 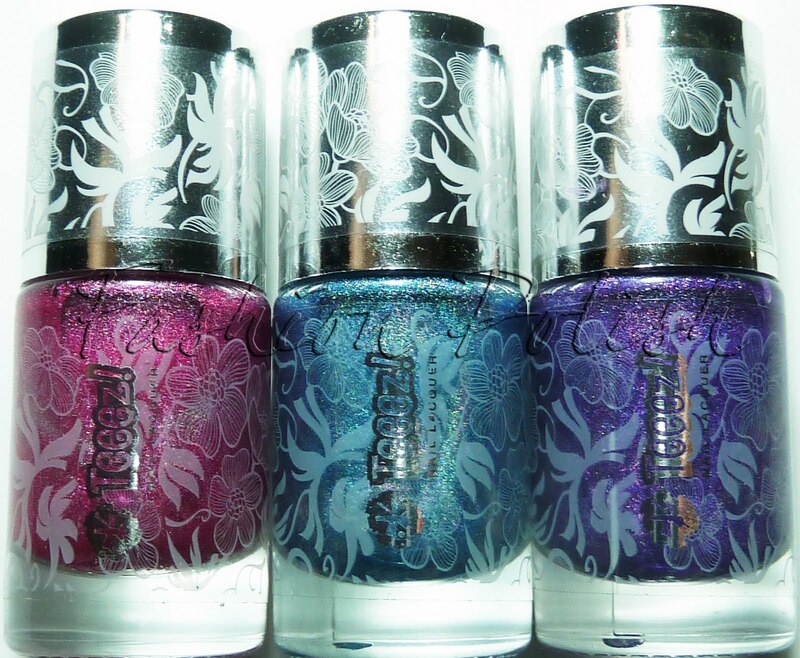 I'm burned out on holos right now but those bottles are beautiful. I always drool a little when someone shows a Teeez polish, and this is no exception!